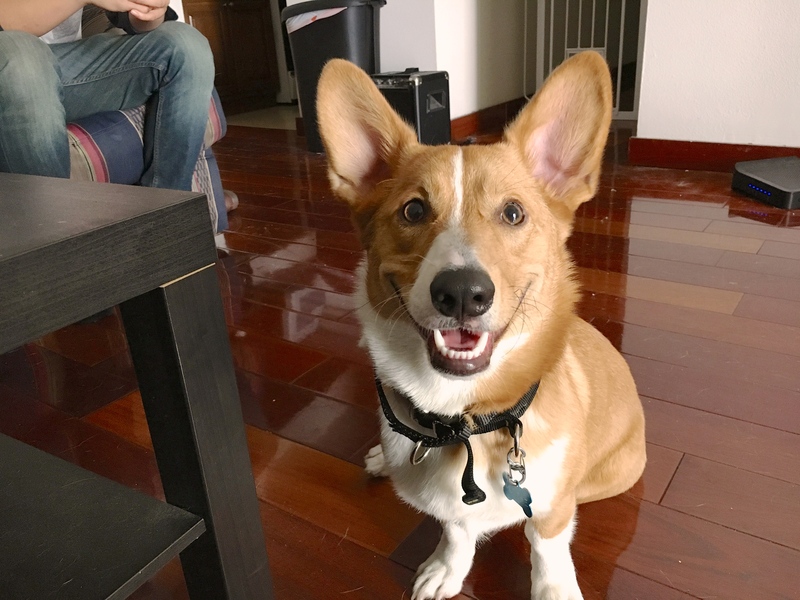 Munchie is a nine-month-old Pembroke Welsh Corgi who lives in Westwood, California. His guardians set up a dog behavior training session to get her to stop getting excited, stop dog barking and reacting to sounds she doesn’t understand.. I got to see the excited behavior as soon as the door opened for our dog training session. When I sat down with Munchies guardians, I learned that he didn’t have many rules or boundaries. Because dogs probe to determine limits and what is and is not allowed, this likely gave him the impression that he had the same authority as the humans he lives with. When a dog see’s you as a peer or equal, than listening to you becomes optional. I recommended some rules and boundaries and showed the guardians how to enforce them. While rules and boundaries may not seem related to over excited dog behavior, they absolutely are. Following rules and respecting boundaries requires observance and self control; two skills that are usually lacking on dogs who get over excited. I showed the guardians how to delay gratification which is a great way to help an excited dog learn to develop control. If you pet an excited dog, you are rewarding that behavior. Over time, consistently stopping the petting the instant the dog gets excited can help it learn that the only way to get that affection is to stay calm and balanced. Many of Munchie’s behavior problems revolved around reactivity to unknown sounds; barking at them. I experienced this first hand when he started barking as I undid a velcro band around a leash. I handed my camera to one of the guardians and had her film me so I could I show them how to use counterconditioning to stop Munchie from barking in protest when he heard that (or any other sound). Counterconditioning is a very effective technique to stop dog behavior problems as long as the dog does not feel threatened and the handler only gradually decreases the distance between the dog and whatever it is reacting to. By the end of the session, Munchie was showing respect for his guardian’s space, starting to sit to ask for attention and had stopped barking at the velcro sound. Now this session isnt gong to stop him from barking at Velcro (and other sounds) permanently. But if his guardians consistently practice the counterconditioning exercise and enforce rules and boundaries, this new good behavior should continue and eventually become his normal. Introduce rules and boundaries and consistently enforce them. Start petting Munchie with a purpose. Try to pet Munchie within 3 seconds of doing a desired behavior and only say the command word. Stop petting Munchie when over excited. Use passive training to reward Munchie for engaging in desired actions or behaviors. Practice the heel exercise as shown in the session (Walk around munchie first, then holding the treat on the seam of the pant leg, then starting off on the seam and moving up to the opposite shoulder before delivering it). When Munchie gets to the raised treat loose leash step, move to the hallway and start adding one extra step each practice session. Practice establishing a boundary to the bedroom with Munchie inside and the humans in the living room. Progressively extend the length of time Munchie stays in the bedroom (with the door open) with his guardians in the living room. Start at 5 seconds after laying down, then go slowly only adding one minute at a time. If Munchie cant handle a new extended time, back up and practice the previous time a few times before trying to add time again. Munchie doesn’t have to stay laying down the whole time, but start the time after he lays down the first few times to help him stay calm. Practice the counterconditioning exercise often (preferably multiple times every day) for each sound Muncie is reacting to. Pick a few sounds to work on first and get to no reaction 5 or more times in a row before moving on to another couple of sounds (but work with each sound in its own practice session). Add structure to meal time and make Munchie wait for the human to eat first then give him permission to eat food waiting in his bowl.